This card is among the best hotel rewards credit cards. 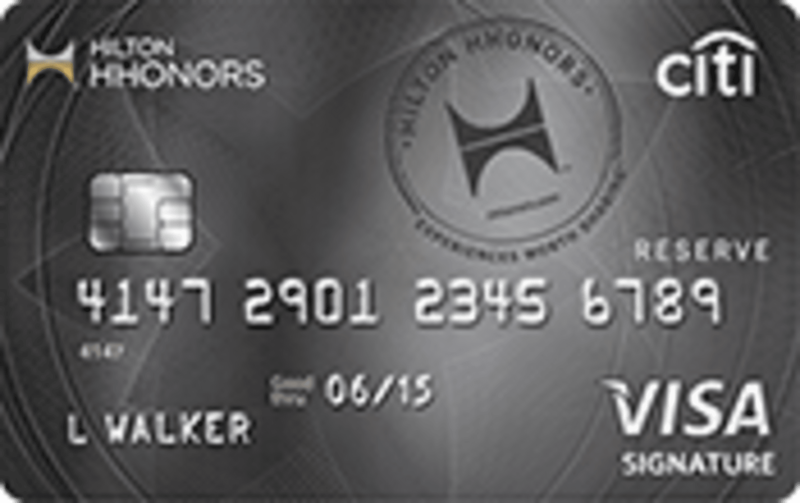 The Citi® Hilton HHonors™ Reserve Card is one of our favorite hotel credit cards and among the most value add rewards credit cards available. Meant for higher spending consumers it combines a huge package of bonuses with rewards focused on Hilton properties. We took an in-depth look at the card's different features and how you should use it to make it worthwhile. For cardholders looking for a Hilton credit card or even any hotel credit card the Citi® Hilton HHonors™ Reserve Card offers the best package of benefits provided you can meet the spending requirements. The bulk of the value in the Reserve come from the two bonuses that are available to cardholders, the 2 weekend nights welcome bonus, and the 1 free weekend night anniversary bonus. To earn both, cardholders should expect to spend $10,000 annually, with at least $2,500 in total spending on the card during the first four months of approval. The two bonuses are worth hundreds of dollars each and are key in making the card worthwhile. Outside of the bonuses, the card performs best when used primarily at HHonors properties, with rewards earned on spending for hotel stays among the most lucrative we've seen. On other purchases however, the card is not nearly as competitive as we'd like it to be, and better options exist like the Capital One® Venture® Rewards Credit Card, which yields 2% in rewards vs the Reserves approximate 1.5%. HHonors points are worth significantly less per point than other loyalty points so a straight forward comparison is usually quite difficult. Overall we estimate that they're worth around half a penny each so keep that in mind when weighing this card against other options. With the Reserves's 10 points per dollar spent on HHonor properties, this equates to a 5% rewards rate on average significantly higher than you can get with a general rewards credit card. This is why we think the Reserve can often make sense for high volume travelers that are already members of the HHonors program. The extra bump can equate to very high savings. Reserve cardholders are immediately granted Gold Status with the HHonors loyalty program. Normally this would require 20 stays, 40 nights or 75,000 base points to achieve. With Gold Status, you'll get a 25% bonus on the HHonor Base Points that you earn through the loyalty program. As mentioned in the benefits above, cardholders that spend more than $40,000 on the card in a given year will be awarded Diamond Status with the loyalty program. For cardholders that may consider using this card for business expenses, it may be a quicker way of achieving that tier in Hiltons loyalty program. Diamond members get a 50% boost to the Base HHonors points they earn on hotel stays and would normally require 30 stays, 60 nights or 120,000 base points to achieve. Considering that 120,000 base points is the equivalent of $12,000 in spending at Hilton HHonors the value of this perk really depends on how much you spend away from Hilton Resorts. Hilton honors points are tricky in that you get more points for your spending than just about other rewards card on the market, but these points are also generally worth a lot less. Cardholders also have a number of options for how to use their points and the value of the points will really depend on which option you choose. Like all loyalty points, the HHonors points can have a variety of values depending on how and when you choose to use them. The value of HHonors points can range from .38 cents per point to a higher .75 cents per point when used aggressively on hotel stays. Overall we think the average value of a HHonors point is .6 cents. The points you earn with the Citi HHonors Reserve can also be transfered for awards at large number of partner. The conversion rates are pretty poor overall however, with many airlines converting the points at a 1 for 10 ratio. With airline miles worth anywhere from 1 - 1.5 cents each, it just isn't worthwhile making that trade. How Do the Rewards Perform? Given our value assessment for the HHonors points, the Citi® Hilton HHonors™ Reserve Card performs pretty well as a rewards credit card. On everyday spending, the 3 points per dollar spent yield around 1.5% in rewards. While this may be lower than cards like the Starwood Preferred Guest® Credit Card from American Express, it is still above average among most credit cards. Where the card really shines is in the Hotel specific bonuses. The 10 points per dollar spent on Hilton HHonors hotel stays safely yields a 5% rewards rate. This rewards structure is why we think the HHonors is most suitable for cardholders that plan on spending a lot of time at Hilton Hotels each year. This would take advantage of it's best spending rewards benefit. The spotlight feature of the Citi® Hilton HHonors™ Reserve Card are in the initial welcome bonus and the annual anniversary bonus you can achieve, with both worth hundreds of dollars. New card holders are eligible to earn 2 weekend night certificates if they spend $2,500 in purchases within the first 4 months of their account membership. With a wide variety of properties to choose from, each weekend night can be worth as much as $500 dollars a piece. The welcome bonus alone is a good reason to consider getting the card, as you could easily use it to earn a luxury weekend at a Hilton Property. We estimate the value of the welcome bonus to be between $500 - $700. While most card bonuses are one time deals, the Citi® Hilton HHonors™ Reserve Card does give its cardholders an additional annual bonus to earn. Spend $10,000 in a year and earn a single weekend night at select Hilton properties. While this is clearly much more difficult to achieve than the welcome bonus it's a vital part of making the Citi® Hilton HHonors™ Reserve Card a reasonable everyday spending card. This bonus is essentially worth 2.5 - 3.75% on your first $10,000 spent each year. We estimate that this bonus is worth $250 - $375 annually.